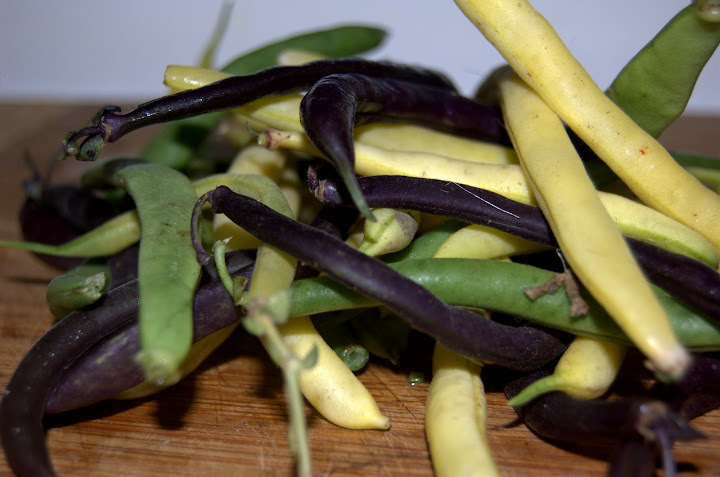 Anyway, the plan for tonight was barbecued chicken, with the potatoes on the side and some lovely steamed-crisp wax beans…which, to my delight, were also purple! Well, some of them…most of them were yellow and green, but a handful of purple ones shown through. Exciting. I had intended on steaming the potatoes and then crisping them up in the oven, using a particular favorite technique of mine, which is to heat a sheet pan in the oven for about 7-8 minutes until it gets very hot, add a bit of olive oil, see if it steams and if so, add the potatoes (carefully), and hope they sizzle. This way, the potatoes begin to crisp immediately…and they don’t stick to the pan. But Josh had other ideas. While I like crispy potatoes, Josh is really a mashed potatoes kind of guy. And he wanted mashed potatoes. And while the potatoes we had weren’t the starchy ideal for mashed potatoes, they would do. I still steamed them first though. I hate to boil things if I don’t have to–it leeches out too many nutrients and too much taste. I’m lucky enough to have a bamboo steamer, which my mother-in-law was sweet enough to buy me. They’re not super expensive, but I try not to buy myself kitchen stuff because…well, I feel guilty. I have a lot of kitchen stuff. But I love this bamboo steamer. It’s lovely and fantastic and efficient–two tiers for me to steam various things—dumplings, vegetables, chicken. It’s easy to clean–and steaming things is not only healthier (because it helps the food retain more nutrients), it’s fast. Hallelujah. 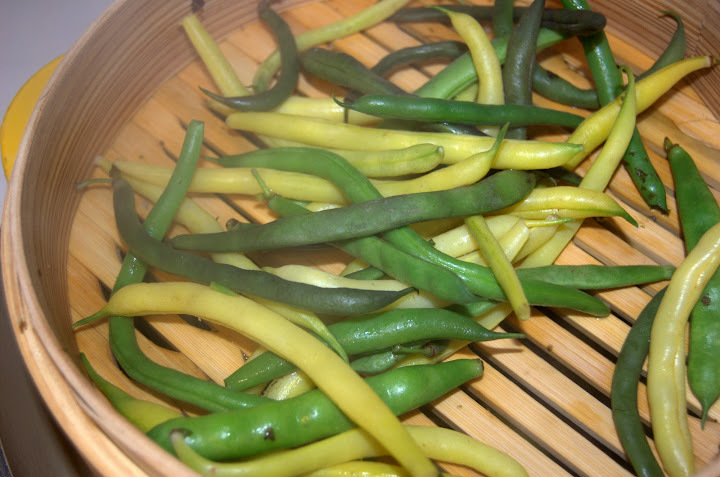 I chopped up and washed a pound or so of the potatoes, and washed a couple handfuls of wax beans (in a separate bowl). I set a large pan on the stove with about an inch of water in it and turned the burner on to about medium heat and let the water heat through a bit. Then I nestled the first tier of the bamboo steamer in the pan and added the potatoes to it. I put the lid on the steamer and let the potatoes go for about 20 minutes, or until soft. During the last couple of minutes, I took off the lid, added the second tier with the beans in it, and covered it all back up again. When the potatoes were done, I pulled them out and tossed them into my stand mixer. Now, the benefit of steaming them (besides speed and nutrition), is that there’s no starchy water to deal with. The downside of steaming them is that there’s no starchy water, so there’s no using that to help smooth out your potatoes. However, to get them nice and creamy, I just added a heaping tablespoon of butter, a splash of olive oil, and then slowly streamed in lowfat milk (I had to, I mean, there’s already butter and olive oil in there) and let the mixer run for a few minutes until the potatoes were nice and smooth with a few chunks of skin poking through. Bright purple skin. Oh yes, the steaming slightly lightened their color (and zapped it from the beans entirely) but they were still…pretty purple. 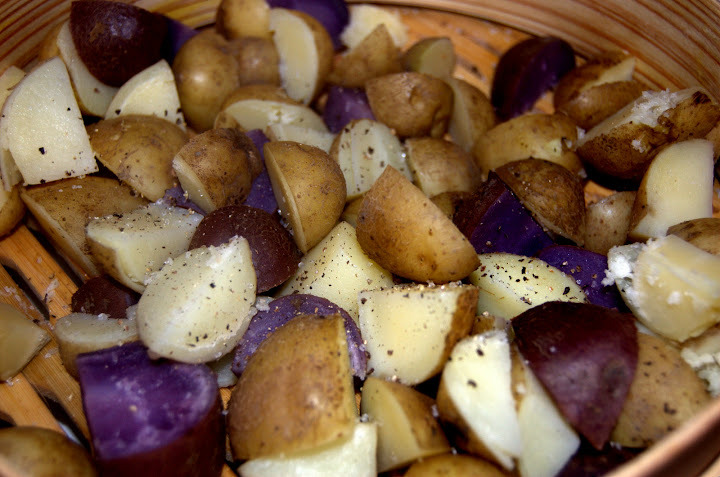 And when mixed in with the other potatoes…well it just gave the whole bowl a nice light violet. Ha. Great. So that was my night. It’s a lame blog post, and I’m sorry, I’ll make it up later this weekend with turkey meatloaf or chocolate graham cracker cupcakes or something. I just wanted to share my love of the purple vegetable. Really it makes me realize though how important little fun things like that can be. I mean, in general, this was a pretty mundane dinner for us–I’m not even sure why I’m blogging it, entirely. And I think that when cooking–or anything–becomes mundane, we tend to appreciate it less. Now, I love to cook and I love food, but I have new appreciation for the potato now. 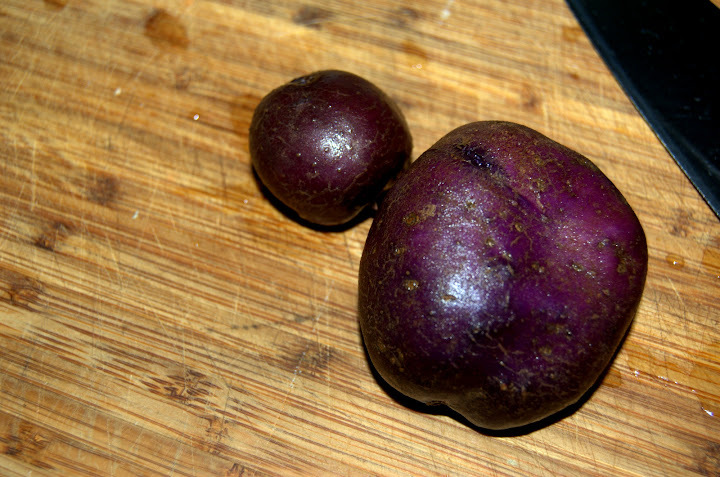 I am actually cheered by having little purple potatoes. It’s an interesting, uplifting sort of feeling. So that’s all. Enjoy! 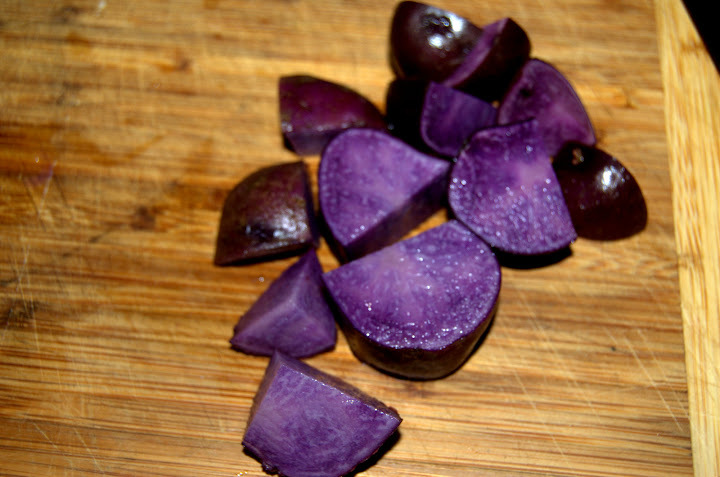 And I hope you have little purple potatoes today, too. Yum… I love all these different varieties of potatoes!